Since Friday, May 3 tens of thousands of undergraduates, high school students, teachers, and young workers have engaged in a new kind of combat in the streets and faculties alike. 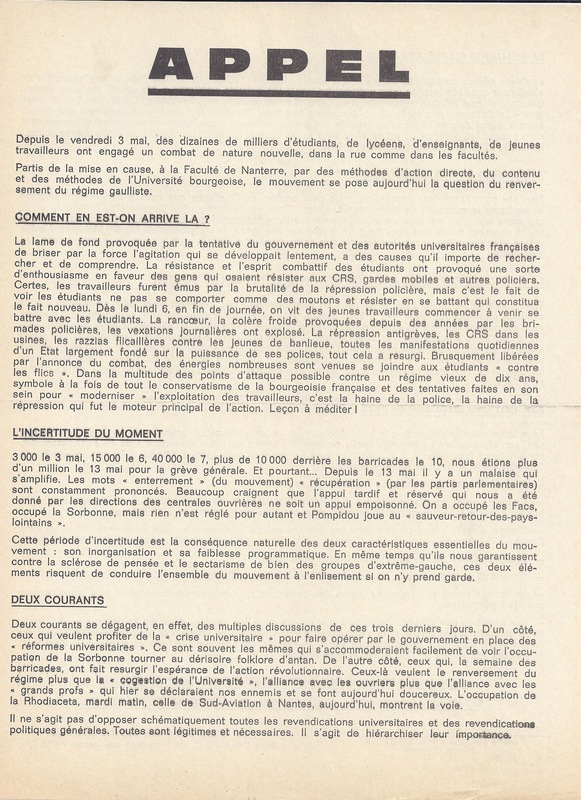 Beginning at Nanterre with the questioning through proper methods of action of the bourgeois university’s terms and methods, the movement today poses the question of overthrowing the Gaullist regime. The groundswell, provoked by the attempt of the government and the French academic authorities to break by force the slowly developing agitation, had causes that it is important to investigate and understand. The resistance and combative spirit of the students provoked a sort of supportive enthusiasm from the people who dared to resist the CRS, mobile guards, and other police. Certainly the workers were moved by the brutality of the police repression, but it was the fact of seeing the students not behaving like sheep and resisting by fighting that constituted the new state of affairs. Since Monday the sixth, at the end of the morning we see young workers beginning to come out to fight alongside the students. The rancour the cold-heartedness provoked over the years by police persecution, and the daily vexations all exploded. The anti-strike repression, the CRS in the factories, the pigs’ raids against the children of the poor suburbs, all the daily manifestations of a State largely based on the strength of its police – all of this resurged. Abruptly freed by the announcement of combat numerous energies came to join with the students “against the cops”. Of the many possible points of attack against a ten-year-old regime, symbol of all of the conservatism of the French bourgeoisie and of the attempts made in its heart at “modernising” the exploitation of workers, it is the hatred of the police, the hatred of repression, that is the principal driving force of the action. A lesson to consider! 3,000 on May 3, 15,000 on the sixth, 40,000 on the seventh, over 10,000 behind the barricades on the tenth, we were more than a million on May 13 for the general strike. And nevertheless… since May 13, there is a growing malaise. The words “burial” (of the movement) and “recuperation” (by the parliamentary parties) are mentioned constantly. Many fear that the support and reserves that were given to us by the leaders of the central workers’ organisations were a poisoned chalice. We have occupied the colleges, occupied the Sorbonne, but nothing is settled as long as Pompidou plays at being “savior-returned-from-distant-lands”. This period of uncertainty is the natural consequence of the two essential characteristics of the movement: its disorganisation and its programmatic deficiencies. While they safeguard us against the ossification of thought and sectarianism of many extreme Left groups, these two elements risk driving the movement at large to collapse if we do not take care. Indeed, two trends become clear from the many discussions of these last three Weeks. On the one hand are those who wish to profit from the “academic crisis” to make the government operate in the place of “academic reforms” These are often the same ones who readily agreed with seeing the occupation of the Sorbonne as a return to the pathetic folklore of yesteryear. On the other hand are those who during the week of the barricades, revived the hope of revolutionary action. These wish for the overthrow of the regime more than the “joint management of the University”, alliance with the workers more than alliance with the “great profs” who yesterday declared themselves our enemies and today pretend to be sweet. The occupation of the Rhodiaceta Tuesday morning, and of Sud-Aviation in Nantes today, shows the way. The point is not to simplistically oppose all academic demands with general political demands. All are legitimate and necessary. The point is to organise a hierarchy of their importance. Not to organise ourselves, but to take advantage of the audience that has given us our courage and explained the necessity of overthrowing the regime. In the poor suburbs we must go to restore the sincerity of our struggle, to say why we are against capitalism. We must also go to learn the concrete truth of that which we know from books: the exploitation of work. Now, finally, we must take back the streets, for it is there that the confrontation is taking place and that the alliance with the workers is being made. Three trends are expressed about the question of organisation. The leaders only intend to profit from the situation in order to strengthen their own group, unaware that if the masses refuse to enter it is not uniquely the consequence of their weak politicisation, but because they refuse their leaders’ sectarian quarrels or their opportunistic parliamentarism Others propose to organise as little as possible in order to guard the movement’s creative spontaneity. These comrades are fooling themselves as well, for they do not understand that while it is possible for 500 to organise themselves spontaneously to make a barricade, it is totally impossible to overthrow the regime using the same means. Its necessary to organise the base, in action, for action. Their form can be diverse: the disciplinary base, the base of small districts, the base of the workplace, etc. But they have this in common: they are units of small size, of 10 to 30 people, because they are made for discussion, and they are above all made for action. When there is an assembly of 200 people, split it into 10 Committees! Each Committee gets together every one or two days. – Each Committee sends a delegate to the daily coordination meeting, at 2 p.m., at the Sorbonne, staircase C, first floor (at 6 p.m. for those who cant make it at 2 p.m.). 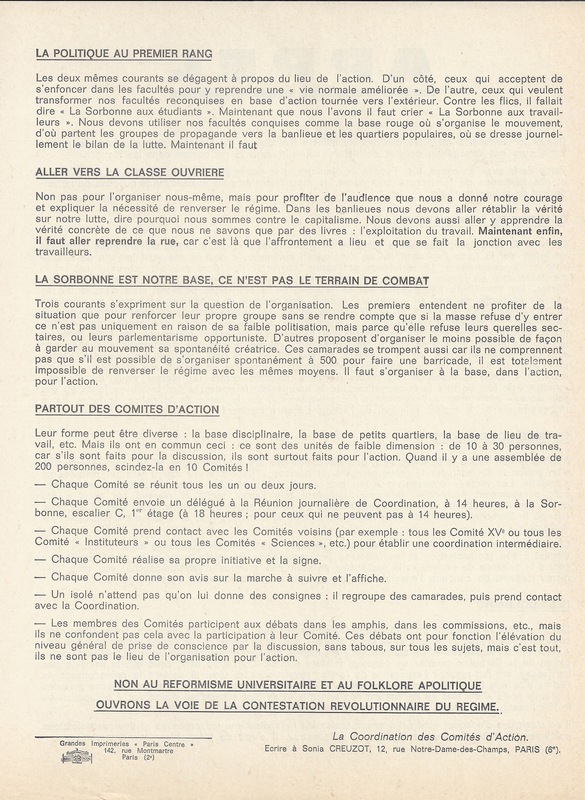 – Each committee makes contact with nearby Committees (for example: all the Committees of the 15th arrondissement or all the “Institutional” Committees or all the “Science” Committees, etc.) to establish intermediate coordination. – Each Committee realises its own initiative and sign. – Each Committee gives its advice on which course to follow and posts it. – A solitary person doesn’t wait to be given his instructions; he regroups some comrades, and can make contact with the co-ordinators. – The members of the Committees participate in debates in the lecture halls, in the committees, etc., but they do not set this against participation in their Committee. These debates are for the elevation of the general level of realisation through discussion, without taboos, on all subjects but thats it; they are not the place for organising action.